we've gotten a bunch of feedback, most of which was overwhelmingly positive. Today, we're happy to bring even more improvements to Top Search Queries that we've implemented as a direct result of your feedback. First of all we've shortened "Top Search Queries" to be just "Search Queries" to better reflect all of the data provided by this feature. In addition to the name change you'll notice that Search Queries has several new updates. As requested by many of you, we're now showing an "Average position" column right on the main Search Queries page. This provides a quick at-a-glance way to see where your site is showing in the search results for specific queries. The other change you'll notice is that we're showing a "Displaying" number for Impressions and Clicks. 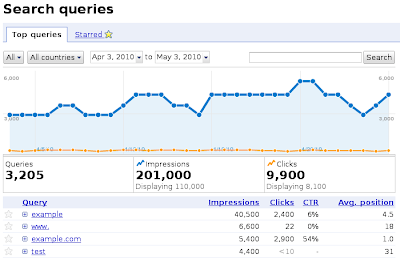 This number represents a total count of the data displayed in the Search Queries table. 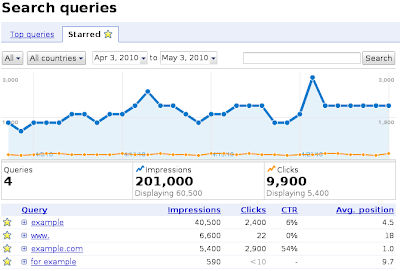 The number in bold appearing just above it is a total count of all queries including the "long tail" of queries which are not displayed in the Search Queries table. When the "Displaying" number is not visible, such as when you select a specific country from the "All countries" drop-down menu, then the bold number is the total count of the data displayed in the Search Queries table. We've also added an Average position column to the Search Queries download. The other addition we've made to Search Queries is a "Starred" tab. Next to each Query on the Search Queries page there is now a clickable star icon. You can click the star icon for all of the queries that are of most interest to you. All of the queries that you "star" will be consolidated under the Starred tab providing a super easy way to view just the queries you care about. We hope that this update makes Search Queries even more useful. If you've got feedback or suggestions for Search Queries please let us know in the Webmaster Help Forum. Since we released the latest version of Top Search Queries in Webmaster Tools we've gotten a bunch of feedback, most of which was overwhelmingly positive. Today, we're happy to bring even more improvements to Top Search Queries that we've implemented as a direct result of your feedback. First of all we've shortened "Top Search Queries" to be just "Search Queries" to better reflect all of the data provided by this feature. In addition to the name change you'll notice that Search Queries has several new updates. As requested by many of you, we're now showing an "Average position" column right on the main Search Queries page. This provides a quick at-a-glance way to see where your site is showing in the search results for specific queries. The other change you'll notice is that we're showing a "Displaying" number for Impressions and Clicks. 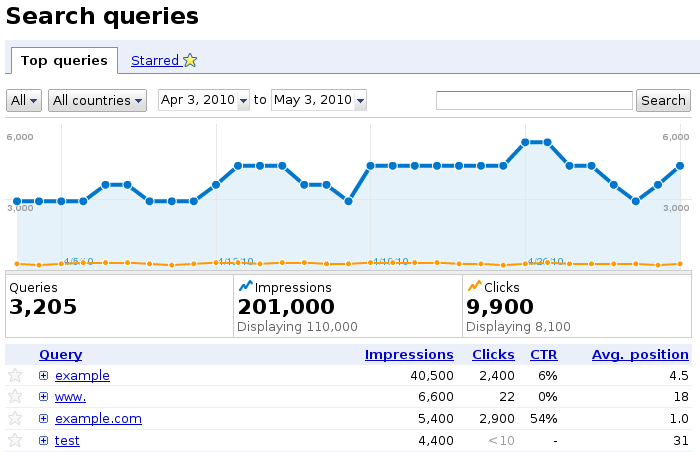 This number represents a total count of the data displayed in the Search Queries table. 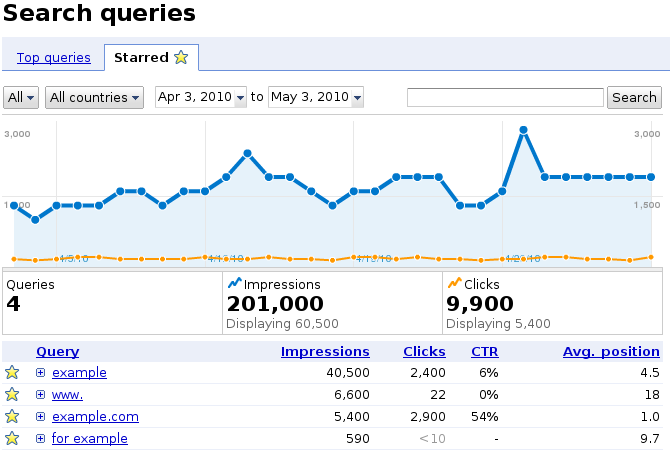 The number in bold appearing just above it is a total count of all queries including the "long tail" of queries which are not displayed in the Search Queries table. When the "Displaying" number is not visible, such as when you select a specific country from the "All countries" drop-down menu, then the bold number is the total count of the data displayed in the Search Queries table.